The Rebel Sweetheart. : Revision of Visa-Free Entry Policy to South Korea. Revision of Visa-Free Entry Policy to South Korea. Earlier this month, I blogged about the Multiple Entry Visa to Korea and how BDO and BPI credit cardholders can avail of this privilege. 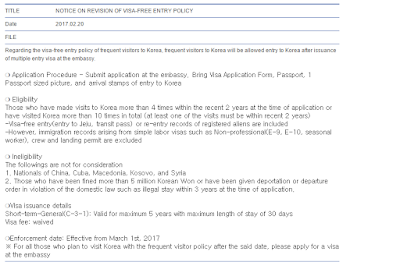 Just recently, the Korean Embassy made a revision on their visa-free entry policy and the announcement was posted on their official webpage. "Regarding the visa-free entry policy of frequent visitors to Korea, frequent visitors to Korea will be allowed entry to Korea after issuance of Multiple Entry Visa at the Embassy. - Submit application at the embassy. - Bring Visa Application Form, Passport, 1 passport-size picture, and arrival stamps of entry to Korea. - Those who have made visits to Korea more than 4 times within the recent 2 years at the time of application or have visited Korea more than 10 times in total (at least one of the visits must be within recent 2 years) . - Visa-free entry (entry to Jeju, transit pass) or re-entry records of registered aliens are included. - Those who have been fined more than 5 million Korean Won or have been given deportation or departure order in violation of the domestic law such as illegal stay within 3 years at the time of application. 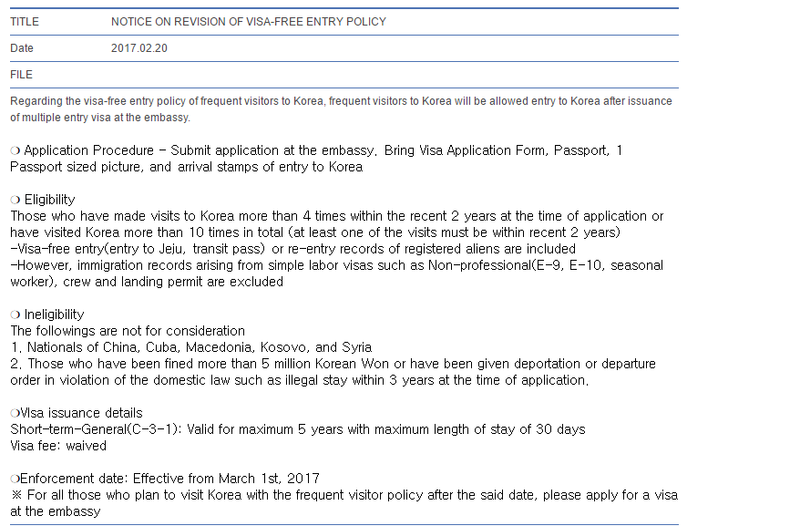 ※ For all those who plan to visit Korea with the frequent visitor policy after the said date, please apply for a visa at the embassy." Previously, the visa-free policy is applicable to any individual who has been to Korea for four times within two years. This is mainly the reason why Yue and I have been going back and forth to Korea since 2015. We were aiming for the visa-free entry after our fourth trip, which will be this Spring. Thus, I have mixed feelings about this revision because that means I will have to visit the Embassy again when our multiple entry visa expires next year. Oh well. For other announcements, please visit the Embassy's official webpage. This will help visitors can spend now more weeks, extend their visa on the island then travel on to the mainland for up to a further two weeks. Thank you for clarifying things. We have not traveled to Asia yet and we hope we can soon. South Korea would be one of the places we'd love to include in our itinerary. Thank you for letting us know. It is good that we were able to learn about this so we can plan accordingly. I would love to visit Korea soon! I think it's a good move. Were you able to travel four times to Korea to become eligible? I'm sure it will make things easier for you guys to visit your husband and explore more of Korea! Hi. I've been to jeju 4 times . I just wanna know and make sure if I'm qualified to apply for the MULTIPLE ENTRY VISA TO KOREA. Would you help me how WOULD I APPLY?